Pirates in the Gulf of Aden have seized a Greek-owned cargo ship. The BBC's Jonah Fisher, on board a UK warship 100km (60 miles) away, said the captain of the MV Saldanha radioed that pirates had boarded his ship. The Saldanha is now heading to Somalia under pirate command after the UK navy's HMS Northumberland judged it was beyond its remit to pursue the ship. 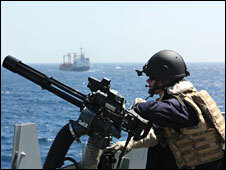 The warship is part of an EU task force patrolling the waters off the unstable Horn of Africa to deter pirate attacks. But when the captain of the Saldanha made contact with HMS Northumberland, he told the ship that pirates had warned the British warship to stay away. Trying to retake captured ships is not what the EU's anti-piracy task force does, our correspondent reports from on board the UK vessel. After sending a helicopter up to take a closer look, the frustrated commander of HMS Northumberland had to accept there was nothing more his men could do. The MV Saldanha was reportedly sailing under a Maltese flag when it was hijacked. The Greek merchant marine ministry confirmed the Saldanha was seized, adding that the ship was manned by a 22-strong crew, Reuters news agency reported. The ministry said the ship was loaded with coal and was heading to Slovenia, Reuters said. Pirates from Somalia target merchant ships sailing through the busy Gulf of Aden, which connects Europe and Asia. Greek ships have found themselves in the pirates' sights before, with a ship carrying salt to Kenya seized off Somali waters in September 2008. The MV Genius and all of its 19 crew were released in November. The International Maritime Bureau has issued a warning to shipping recently, saying that the risk from piracy off the coast of Somalia was rising again, after the number of pirate seizures dropped off at the end of last year. The bureau's reporting centre in Kuala Lumpur says six ships were attacked last week, but all managed to escape. The bureau blamed the heightened risk on more favourable weather and the temptation for pirates to target more ships for ransom, after recently releasing a number of hijacked vessels.